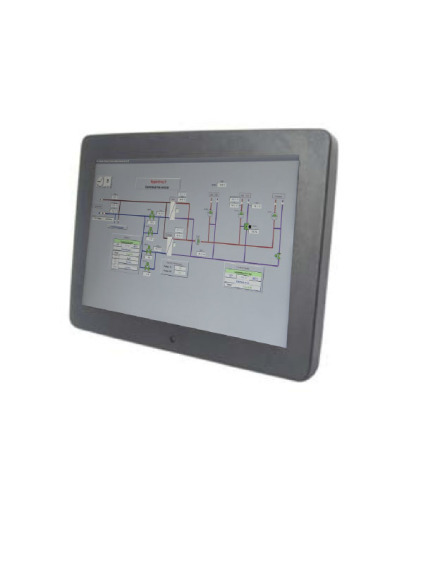 BA Systems offers a wide range of products for BMS. Intelligent controllers with advanced expansion possibilities. The products supports BACnet/IP and ModBus/IP communication. An OPC server is also offered. 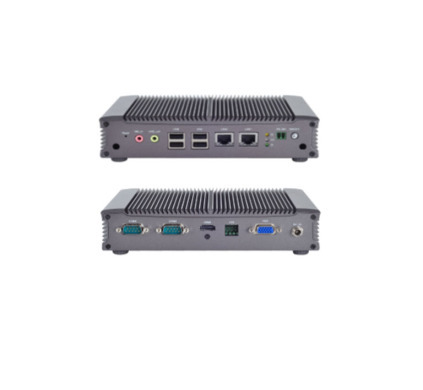 A Multi-tier multi-user server based Web SCADA system is also offered. The server can be hosted at the enduser, at the installer or in our server farm. Access control is offered for all data, making it possible to protect sensitive data as needed. There's of course access to display of trend-curves, real-time readings as well as setpoints, timer etc. The client software can be run from almost any computer/operating system as long as a html5 compatible browser is installed. A short productpresentation is shown below. Datasheets can be accessed directly below the individual presentations. BAS1020 belongs to a family of freely programmable controllers designed to be scalable from smaller standalone installations to very large installations. BAS1020 is well suited to control heating, ventilation aso. BAS1020 is plug-in compatible with BAS920 which it replaces. For mere information please read the datasheet. BAS920AI is an analog input module suited for BAS1020 and BAS920. 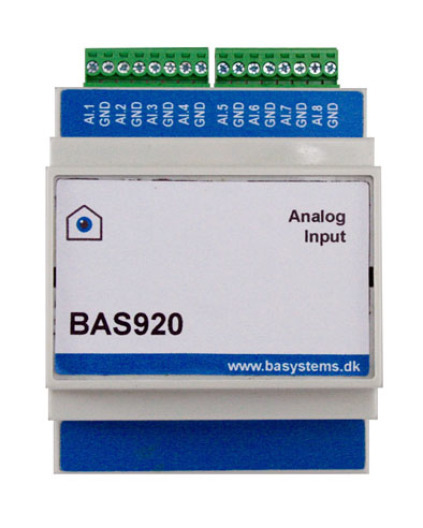 BAS920AI contains 8 analog inputs that can be software configured to read impedance, current or voltage. All channels can be confgured individually. For more information please read the datasheet. BAS920AO is and analog output module suited for BAS1020 and BAS920. BAS920AO contains 8 analog output channels that can output 0 (2) v-10V. For more information please read the datasheet. BAS920COMM is a communication module suited for BAS1020 and BAS920. BAS920COMM contains 2 separate communication channels, one RS485/RS232 channel and one M-Bus channel. For more information please read the datasheet. BAS920DI is a digital input module suited for BAS1020 and BAS920. 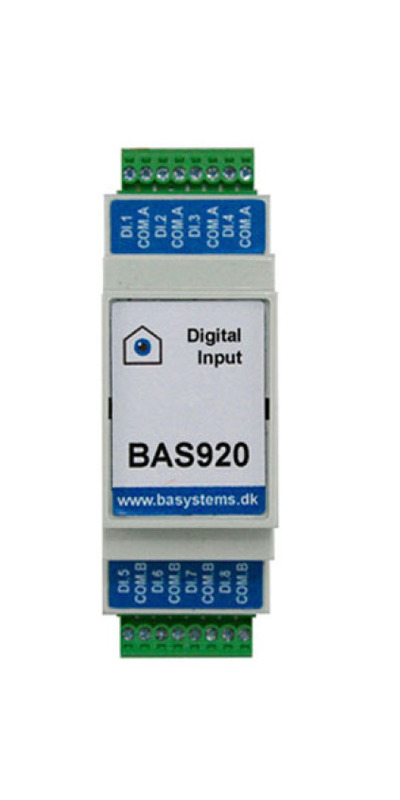 BAS920DI contains 8 digital inputs that via BAS1020 can be set to measure hi/low or act as a counter input. All 8 channels can be configured individually. For more info please read the datasheet. 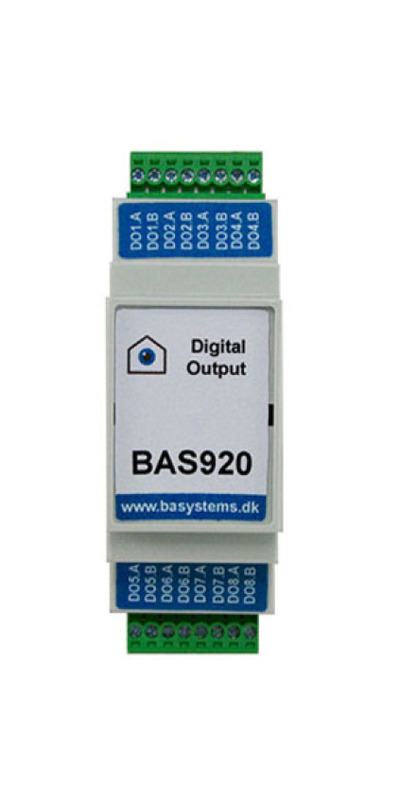 BAS920DO is a digital output module suited for BAS1020 and BAS920. BAS920DO contains 8 digital outputs that can act as open/close contact, also the module can toggle a contact set at a given freguency. All 8 channels can be configured individually. For more info please read the datasheet. 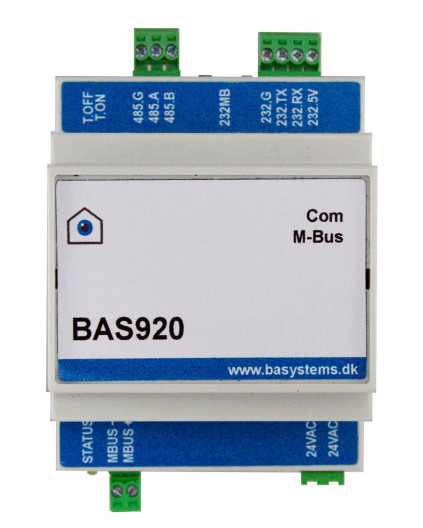 BAS920EXT is a bus-extender module kit that is suited for BAS1020 and BAS920. 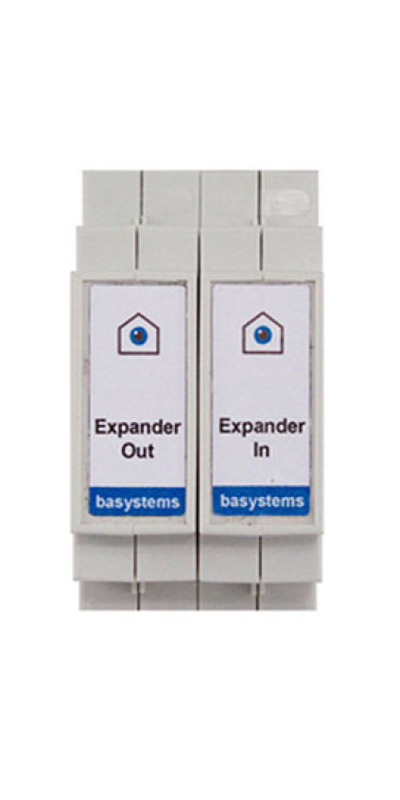 BAS920EXT contains two modules that can extend BAS modules over two rows, More than one set can be used. For more information please read the datasheet. BAS920DIOM is a combined I/O and communication module suited for BAS1020 and il BAS920. 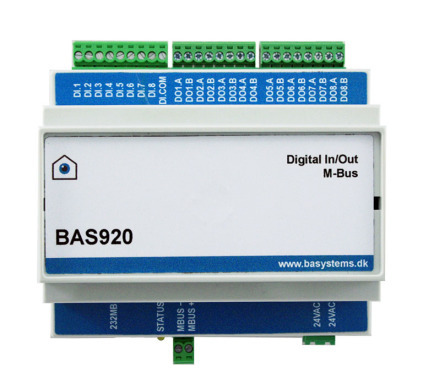 BAS920DIOM contains 1 M-Bus communication channel, 8 digital inputs and 8 digital outputs. For more information please read the datasheet. BAS WebSrv is designed to be a data hub/concentrator and web enabler. 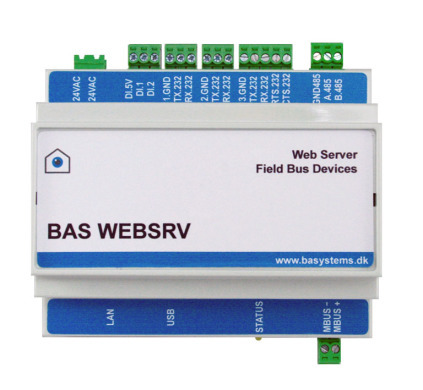 BAS WebSrv is well suited to act as an internet gateway for many equipment types connected to is communication ports. For more information please read the datasheet. BAS Building Server is a DIN rail unit SCADA Server suited for datacollection and presentation from all controllers in the BAS Series. Also data from BACnet units can be collected. For more information please read the datasheet. BAS918S contans 18 I/O channels. For more information please read the datasheet. BAS929S contans 29 I/O channels. For more information please read the datasheet. BAS Display is an Android 10.1” based terminal with touch. With this unit data from a single BAS Series controller as well as the BAS Building Server can be accessed. Dynamic plant information, trendcurve data, timers and setpoint can access and setpoint and timers can be changed. For more information please read the datasheet. 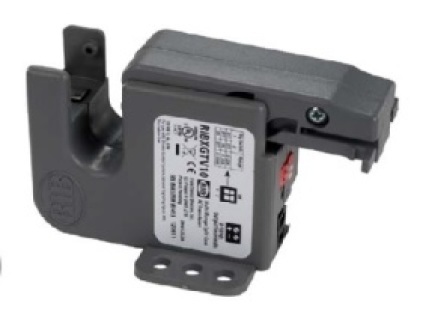 BAS ISENSE is suited for current measurements and can be directly connected to BAS Series controllers. 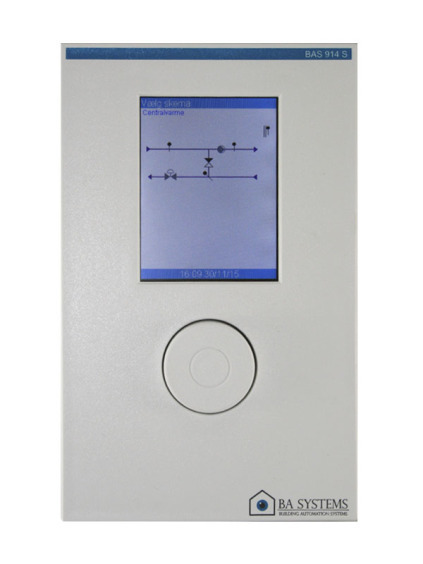 It delivers a 0-10V signal and can be configured for 3 different measurement ranges. For more info please read the datasheet.